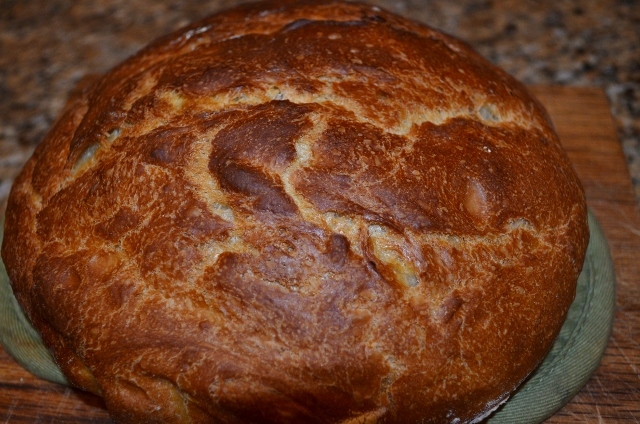 We love no-knead bread made in a hot cast iron pot. It tastes like bread from the bakery with a soft interior with a crunchy crust on the outside. “Quick” is rather a relative term but this method is faster than the traditional no-knead recipes. I have always used the method of mixing the sponge and allowing it to rise overnight or 12-18 hours. That method works great but sometimes you do not have 12 or more hours to wait for the bread to be ready to cook. I have been experimenting with some directions for a quicker version and this yielded bread with a soft inside and a crusty exterior. You make the sponge and allow it to sit for one hour. Then you form it into a ball, let rest for 15 minutes and then place in the hot cast iron pot and hot oven. The bread comes out a beautiful brown with wonderful crust. 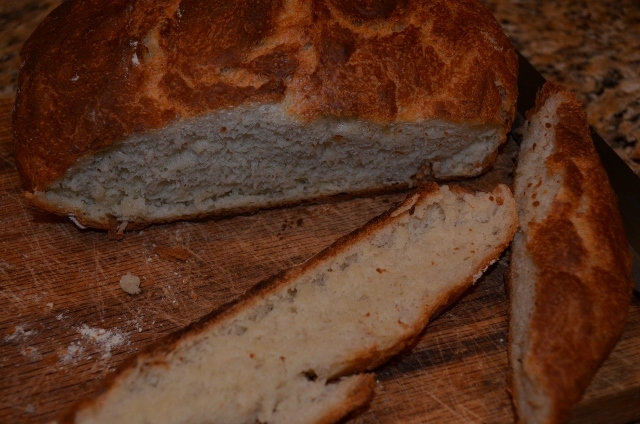 Give it a try if you want a shorter version of great no-knead bread. 1. Add warm water to a large bowl. Stir in yeast and sugar and let sit for 4-5 minutes till mixture begins to bubble a bit and get foamy. Add remaining ingredients and stir with a wooden spoon. Stir vigorously until all flour is mixed and a shaggy dough forms. 2. Cover bowl loosely with plastic wrap or a kitchen towel and allow to rest at room temperature for an hour. As the dough is rising preheat oven to 450 degrees. Place cast iron pot and lid in oven to heat (I use the Lodge Combo for my no-knead bread). 3. After rising for an hour, pour dough on a large piece of parchment paper which has been sprinkled with flour. With well-floured hands form dough into a round ball. (The dough can be difficult to handle). Cover with plastic wrap and allow to rest for 15 minutes. 7. Remove from oven and remove cooked bread from the hot pot. Cool and enjoy wonderful crusty bread! I have never cooked gluten free so don’t know how it will work but it is worth a try. Good luck!